Can Dell’s classy office machine work its magic? The Dell Precision 5520 offers good quality, with solid components, a fine screen and welcoming ergonomics, and it looks the part – but it’s pricey, and rivals are more powerful. 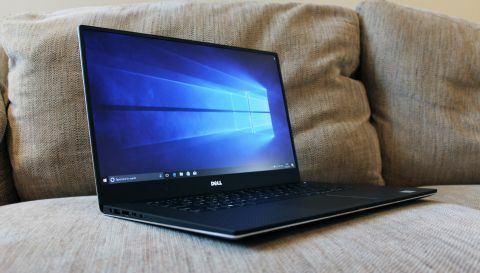 Dell’s Precision notebooks are mobile workstations, which has meant that performance used to take precedence over aesthetics – but these days that’s not the case. This machine serves up high-quality components inside a system hewn from slick metal and carbon fibre, and it’s slim and light. We’ve reviewed the entry-level Precision 5520, but don’t think this machine is weak – it’s still got one of Intel’s latest processors and Nvidia graphics. The model we’ve reviewed is the UK’s entry-level notebook. Its Core i5-7300HQ has four 2.5GHz cores Turbo Boost to 3.5GHz, but there’s no Hyper-Threading – so Core i7 machines will be better for multi-tasking. The memory is mixed. There’s 8GB installed, but it’s only single-channel, and it doesn’t have ECC certification. The CPU is joined by an Nvidia Quadro M1200, which has 640 stream processors, a 1,093MHz core and 4GB of memory – and, importantly, it’s ISV-certified. Elsewhere, there’s a 256GB SSD, the machine is protected by a three-year warranty, and it’s got TPM 2.0. It’s a fine specification, but rivals offer more. The HP ZBook Studio G3 has a Xeon processor, 32GB of memory, a 4K screen and a larger SSD, and the MSI WS63 has a better Quadro GPU, a Core i7 processor and 16GB of RAM. Both are beefier, although they cost around £400 more than the Dell. Our Precision costs £2,101, and every component can be customised. Several Core i7 chips are available and there are Xeons, with the E3-1505M adding £270 to the price. Doubling the memory costs £130, and there are a dozen storage options. Upgrading to a 4K screen adds £253, and the battery can be doubled for £37. Dell’s US approach is different. The firm sells four basic Precision models, with less fine-tuning. The most affordable machine costs $1,399 and has a Core i5-7440HQ, integrated graphics, a basic hard disk and a 1080p screen. The $1,649 version upgrades to a Core i7-7820HQ and the Quadro M1200, and the $2,279 machine adds more memory, a 256GB SSD and a three-year warranty. The priciest US version costs $2,979 and it’s got a Xeon processor, 32GB of memory, a 512GB SSD and the Quadro. Despite that, it retains the 1080p screen. To get 4K you’ll have to spend $299. A few tweaks are available to storage and battery capacity, but that’s it for customisation. The gunmetal lid extends to the panel’s bevelled edges, and the interior is coated in carbon fibre. The two-tone design looks superb, and build quality is good: the wrist-rest and the base barely flex, and the slim screen exhibits surprising strength. Dell has built this sturdy system without making it bulky. Its 1.78kg weight undercuts both rivals, although its 22mm body makes it a tad thicker. It’s hardly a dealbreaker, though – this machine can still be easily carried. It’s also worth noting the Precision’s width of 350mm, which makes it a couple of centimetres narrower than rivals – achieved by cramming the 15.6in screen inside a 14in chassis. The Precision 5520 has two USB 3 ports and a Thunderbolt connection alongside a battery indicator and card reader, but no DisplayPort. There are handy applications to manage battery and power, and the Precision Optimizer has profiles for common work tools, like CAD and graphic design utilities. Less impressively, there isn’t any internal access and the battery can’t be removed. The Dell has a backlit keyboard with a superb action: the buttons depress with consistency and comfort, so it’s easy to get up to speed. There’s not much travel, but that doesn’t matter – the rock-solid base and snappy motion provide ample feedback. It’s not perfect; there’s no room for a numberpad, the Return key is only single-height, and the cursor buttons are tiny. Dell has installed a Precision touchpad here, which means it supports the full range of two- and three-fingered gestures. The surface is smooth and precise, and the buttons are satisfyingly clicky.